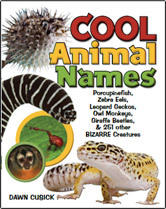 This informational book features brightly colored photographs of unusual animals with amusing and intriguing names. The table of contents identifies the main categories (e.g. tigers, leopards, snakes, etc) and then provides short informational paragraphs about "related" namesakes, such as the Tiger-legged Monkey Frog or Tiger Pythons. Opening pages present images of commonly known animals placed in a simple equation that invites readers into the material. For example, a crocodile appears in front of a plus sign, followed by a turtle and a question mark. A short introduction encourages readers to "get your brain ready to play" (page 9). The book is organized in easy-to-digest chunks, typically featuring six or seven animals per page. The end pages feature four "Name Game" prompts meant to extend learning and inquiry, and there is an index. Newly independent readers will really enjoy the interesting display of life forms. The book has high appeal for both home and classroom use. Teachers and parents might be surprised by the unusual characters introduced, among which squirrelfish, the dog-faced puffer fish and such exotic creatures as spider conchs and bat sea stars are described. Cindy: When Cool Animal Names (Charlesbridge/Imagine! 2011) arrived, I knew that I’d better read it fast if I hoped to ever seen it again. Once our focus group gets their wildlife-loving mitts on this, it’s all over! What a fun book. The first section has chapters that open with a photo and description of a well-known creature followed by a variety of others that share part of its name. For instance, the first chapter starts with a photo and some facts about tigers, including a close-up of its distinctive stripes. Then there are pages of other tiger named creatures: Tiger-legged Monkey Tree Frogs (bizarre-looking spotted frogs with tiger-striped legs), Ruby Tiger Moths, Tiger Pythons, Tiger Snails, Tiger Leeches…you get the idea. Each animal gets a photo and a short description that gives habitat and a quick fact or two. The second section has chapters arranged around one type of critter that has a variety of species named after other animals. The shark chapter features Cat Sharks, Crocodile Sharks, Dogfish Sharks, Elephant Sharks and so on. Some of my favorites? Alligator Bugs from Belize, Rhinoceros Hornbills with the strange brightly colored horn rising from the top of their beaks, and the Dog-Faced Pufferfish that look amazingly like a dog. If the focus group can get their snouts out of this book long enough to share, perhaps we’ll get their reaction. Appropriate for elementary school readers, this book will also have appeal to my 6th grade animal geeks. Lynn: Cindy knows our focus group VERY well. They fell upon this book like starving souls on bread and barely came up for air. I think you could safely say this is a hit. In fact, I had to take it away from them so I could write about it this morning. They were fascinated by the two sections – as was I. I hadn’t really thought about animal names in that way before and this led to some wonderful discussion that could be duplicated in any classroom for certain. The layout of the book is excellent, with bright pictures and clear sharp text. The general category is introduced and explained and then the individual examples follow in an easy-to-understand pattern. Some of our favorites include the giraffe beetle, the peacock moth, the cat bear and the entire section on spiders – of course. Would you have guessed that there are more creatures named after tigers than any other animal? The uses for this book in a classroom are boundless! What a terrific way to get kids to think about categories, animal species and identification. Start with the well-planned “Name Games” suggested on the last page. These are activities an entire class can do. One suggestion uses a photocopy of the title page and asks the students to circle big animals in red and small animals in blue and another asks the readers to research certain animals to find out why they were named after other animals It’s easy to think of many other ideas too. Children can invent and illustrate their own animals – and write a short paragraph about why the name is justified. Common Core anyone? The index and title page are especially well done and easy for children to use. All this and the book is just plain fun to read! Order several – this is a guaranteed kid magnet.